Unlike that of 2009’s Ondoy flooding, what we are currently experiencing is not caused by a storm. I first thought it was an inaccuracy of my mobile’s app. But Philippine Atmospheric, Geophysical and Astronomical Services Administration (PAGASA) confirmed that it was was only but Monsoon rains (a.k.a. Habagat) that we are having. 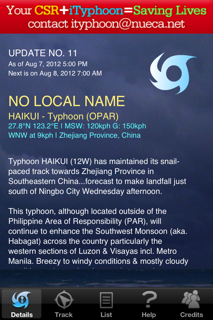 Typhoon Haikui is actually outside of the Philippine Area of Responsibility (PAR). But because of its strength, it continues to enhance the Southwest Monsoon that we are experiencing. As of writing, this is how our front street looks like. Unlike last night’s and this morning’s, when the flood water easily subsided when rain did not pour as hard, the flood water is barely going down even with zero rain. With the Marikina River reaching the Alarm Level 5, currently at 20.6 meters, the flood waters must have saturated lower lying areas. For reference, at the height of Ondoy flooding, its level was at 23. 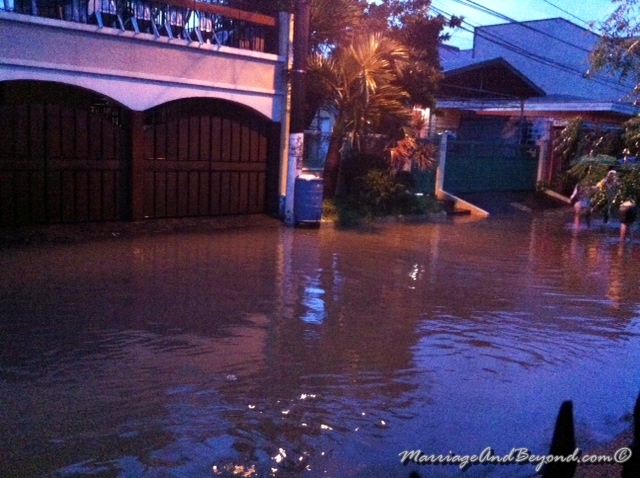 We are three meters short to a repeat of what happened to us during Ondoy. We have already transferred the car to higher ground, inflated our son’s boat where we placed our documents and stuff that we hope not to get wet. Placed some smaller home appliances on top of my son’s bunk bed. As we are told by PAGASA that this monsoon rain is going to cause more flood water than Ondoy‘s, we are left with little choice but to get ready for evacuation. The plan is for us to stay the night at my sister and brother in law’s place. We have already transported some of our stuff to their house. We also decided to send our son there earlier so he won’t have to wade on dirty flood water. But in all honesty, I don’t mind all the trouble of packing up. We are still praying that we don’t have to leave and the rain will finally let up for a quite a bit and the flood water all over NCR will altogether subside. News says otherwise but we are praying just the same. 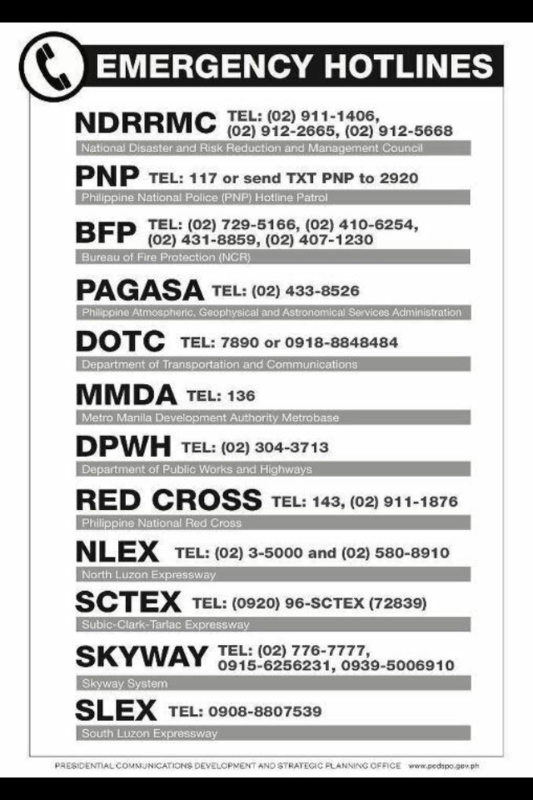 Incidentally, here are some Emergency Phone Numbers we all should take note of. 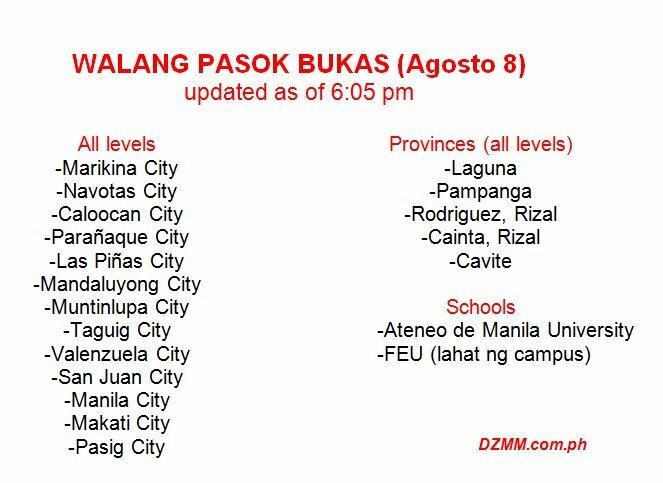 The radio station DZMM has already shared via Facebook a list of cities and provinces in Luzon that have suspended their classes tomorrow. I began feeling ill at ease last night. Jeff and I kept watch through the night. The trauma of Ondoy slowly creeping up my sanity. But today, even as the rain poured, the Lord has allowed for me to dwell in this one verse. My God is bigger than all the storms in the world combined. He has been faithful to me and my family and He promised to never leave us nor forsake us. Praying for our country and for everyone else who are experiencing the wrath of this flooding. Meanwhile, we will have to prepare and keep watch even as the rain just started pouring heavily again.